From time to time the question arises what is the biggest / oldest / longest / etc. flag. This page records some of the answers to these questions. The world's largest APEC flag, which is 80 m wide and 125 m long and is 10,000 sq.m. With an APEC Vietnam 50 m high, 55 m wide logo, the flag was flown aloft by five large balloons on November 20 to welcome APEC Vietnam 2006. It was then given to the Vietnam Revolution Museum. The flag, 156 metres (171 yards) long, 50 metres wide and weighing 1.3 tonnes, was unfurled from the top of a tall new building in Central Jakarta on Wednesday but the wind tore the seams apart, the Jakarta Post said. Mexico has mounted monstrous 164-by-94-feet Mexican flags, hung from gigantic 109-ton flagpoles over three football fields tall, in three locations directly across from the U.S. - El Paso, San Diego, and Laredo TX. For more details on these Mexican flags, see Mexico. "The largest flag in the world - an Israeli flag the size of two football stadiums - has arrived in Israel this week and will be presented at a ceremony in honor of 50 years of friendly relations between Israel and the Philippines. "Two flags of identical size, one Israeli and one Philippine, will be measured by representatives of the Guinness Book of Records, who are anticipated to declare them the "largest flag in the world." "Each flag was sown in the course of 3 weeks by six professional sewers under the direction of two designers and 40 volunteers, and weighs 5,200 kilos (11,000 lbs). Each flag is twice the size of the American "super flag" which holds the title at the moment as the largest flag in the world." The record-breaking Israeli flag was accompanied by a giant Philippines flag - huge, but not quite as big. It weighed only about 3.8 metric tons." Photograph: http://koreanewsonline.blogspot.nl/2013/11/60-years-discussion-finally-ended.html (used for illustrating an article that happened to be about Israel and Philippines). In August of 2004, Pakistan unfurled a 340 x 510 (173,400 square foot) foot National flag. In December 2004, Bahrain unfurled a 318 x 555 foot (176,490 square foot) National flag, breaking Pakistan's short-lived record. On Saturday, June 12th the largest American and largest flag in the world was on display for one hour at Moffett Field in Mountain View California. This flag is 255 feet by 505 feet. It's by Ski Demski who had the Stars and Stripes unfolded on the Hoover Dam. The site http://www.fraternet.org/mdh/mdh_drapeau.htm shows a postcard (450 x 654 pixels) with a photography of the largest flag in the world. "My deepest thanks to all of those who contributed to realize the largest flag in the world, the Tibetan flag. May all these merits be dedicated to freedom in Tibet and peace in the world. Signed by the Dalai-Lama, 6 December 1998". As you can see, the total area of the US giant is a bit more, although the Tibetan's 1:1.3 ratio gives it a greater hoist. Obviously, neither will ever fly from a pole. The flag, measuring 349 m (1,145 ft) by 227 m (744 ft) and weighing five tonnes, was spread over seven acres of an airfield south of the capital, Bucharest. It was broadcast live on national TV. Work on the enormous red, yellow and blue tricolor began two months ago and took hundreds of hours to complete. An estimated 44 miles (70 km) of thread was needed. Prime Minister Victor Ponta and other members of the Romanian government attended Monday's event, which was celebrated with an air show. The largest flag draped measured 101,978 m� (1,097,682 ft�) and was achieved by Moquim Al Hajiri (Qatar) of Brooq Magazine (Qatar), in Doha, Qatar, on 16 December 2013. The dimensions of the flag are: 509.97 x 199.97 m (1,673 ft 1.5 in x 656 ft 0.83 in). According to the Gay Financial News, Gilbert Baker, creator of the Rainbow flag, put together the longest Rainbow flag for the upcoming Rainbow25 festival. The flag is projected to be 8,000 feet long by 16 feet wide in the original 8 colors. It surpasses a mile long flag used in New York in 1994 for Stonewall 25. A flagpole has been erected in the main square of the Turkmen capital Ashgabat in front of the national museum. With a height of 133 metres and weighing nearly half a ton and measuring 52.2 by 35 metres it has been accepted into the Guinness Book of Records.[...]" The flag will be 165 meters tall, and its area will be 2,000 square meters. A virtual film of the anticipated flag, which will be an important landmark of Jeddah, can be viewed at http://www.aljci.org/en/saudi-flag." Two electrical engineering students at the University of Texas at Dallas, Jang-Bae Jeon and Carlo Foresca, produced the smallest flag: 7 microns in height (a human hair is 100 microns in width). The flag, with pole, was cut into a silicon wafer using a microscopic laser (ion beam). The "flag" has not been recognized by Guiness which has no way to verify the image at this time. The two students have also spent months to create a 4 micron U.S. and Texas flag. The world's biggest kite - a giant Kuwaiti flag - will be flying at the International Festival of Kites and Air Creations in Bristol this weekend. Wealthy Abdul Rahman Al Farsi, who runs a cut glass business in Kuwait, commissioned top kite maker Peter Lynn to create the �50,000 mega-kite. It is 42m (115ft) wide, 25m (68ft) long and 7m (19ft) deep and is shaped like a giant pillowcase. It needs filling with air when it is launched. The giant flag took 750 hours to make, using 27,000 sq ft of material. It weighs 400 lbs. and needs to be anchored to four-wheel drive trucks. 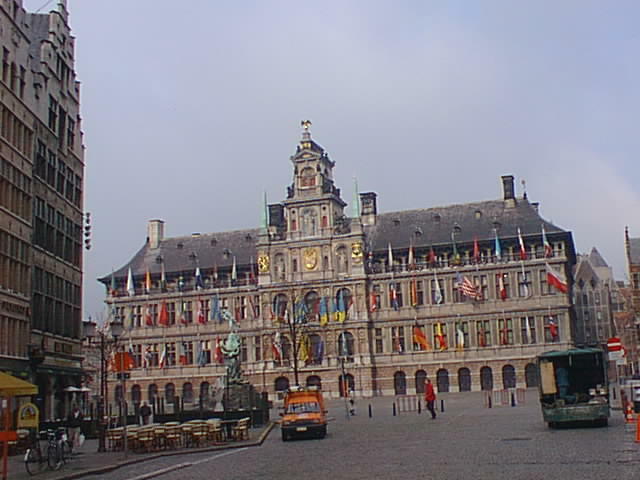 The Town Hall of Antwerpen, Belgium. It is said that they hang the flags of all the nations that have ships in the harbour. This picture shows only the front. To the left is another face with some more flags. In the center, first floor, are the flags of Belgium, Flanders, EU and Antwerp. On the second floor are the flags of the districts. Quite a nice sight in reality! My neighbours flew in from Canberra and gave me a fact sheet of the International Flag Display there. Some points from the fact sheet "..To celebrate this unique aspect of Canberra (i.e. being home to 80 nationalities and cultures) as our capital, the National Capital Authority designed and created the International Flag Display". "The IFD is arguably the world's largest, continuous display of International Flags. Located on the foreshore of Lake Burley Griffin in Canberra's Parliamentary Zone, the Display colourfully acknowledges and is dedicated to those nations and organisations that maintain a diplomatic presence in the national capital." "Maintained by the Authority, the 80 flags fly continuously, 24-hours a day on 12-metre flagpoles. Each flag is lit at night, casting a beautiful and vivid reflection on the Lake ....etc..etc"
(1) "arguably the world's largest" - any challenge from anywhere on this statement? (2) "fly continuously, 24-hours a day" - smart move, save hoisting them up and lowering them. In Madrid, the flags of all OAS member states can be seen on permanent display at the Casa de Am�rica (Linares Palace, Cibeles Square), and occasionally (on the 12th October for instance) at the Museo de Am�rica (near the start of the A6 highway). The flags of all Spanish autonomous communities are on permanent display at the Spanish Senate (near the Royal Palace) and at the IFEMA Trade Fair (halfway to the airport). The Commonwealth Institute in High Street Kensington, London, where all the member nation flags are flown, including Mozambique, and in October, even Pakistan, even though they had just been suspended. I was staying around the corner from the Institute, and it seemed as if the flags were up 24 hours a day. The poles are arranged in rows. There are flags of all nations that the United States has diplomatic relations with in the US State Department. They are in a row, side-by-side, on poles attached to the wall about 5 meters above the ground. According to my almanac, the US has diplomatic relations with 180 nations, so the following 11 should not be represented: Bhutan, Cuba, Iran, Iraq, North Korea, Libya, Liechtenstein, Monaco, San Marino, Somalia, and Taiwan. These are on the road between Whitehall and St James's Park and so form the backdrop to the parade ground where the Trooping of the Colour and other state events take place. I think they are only flown during the Summer, but I must admit I haven't visited the area in Winter. The flags line both sides of the street and appear to be in random order until you remember that this is a display of Commonwealth countries and that they are ordered by their original entry (i.e. ignores any temporary absences) into the Commonwealth. They start by the Guards Memorial directly opposite the clock tower of Horseguards and work their way round anti-clockwise. The headquarters of the United Nations in New York is where the flags of 191 members are displayed (all independent countries except Taiwan and City of Vatican). Rockefeller Center, a few blocks away, has about 200 flagpoles. Sometimes they have the nations of the world, which I assume would have one or two more than the UN (although not as up-to-date). The US flag is front and center, under Flag Code rules. Sometimes they have flags of the fifty states (more than once each, of course), sometimes all US flags, sometimes decorative monocolored flags. The "Vlaggenparade" ("Flag parade") in Rotterdam (The Netherlands) has 220 permanent flagpoles with flags of all nationalities (165) in Rotterdam and flags of sponsors. In April there was/is an exhibition of the flags of the Dutch polderboards. The flags in the Hall of Nations at the Kennedy Center in Washington DC displays the flags of countries whom the United States has diplomatic relations, in alphabetic order from the left hand side by the main entrance (as if your back were to the road), going down the left hand side to the terrace end and coming back up to the right. In the Hall of States, are the flags of the fifty States, in order of admission into the Union, again starting off on the left hand side with Delaware, proceeding down to the terrace end and coming back up to the right hand side, where may be seen the flags of the five territories of the United States. The Swiss National Exposition in Lausanne 1939 and 1964, displayed the flags of Swiss communal and cantonal flags (3000) exceeded all these. I think that flags with most colours are those with a seal, like flags of Haiti, St. Helena, Falkland Islands, Bermuda, Cayman Islands and so on and it's a little hard to count them precisely. Without a seal, it's certainly South Africa that have the most colours with 6, but we can also mention the local flag of St. Pierre & Miquelon. Nasr Hamood Al Nayadi, member of the Emirates Aviation Society and the UAE Free Fly Team, has performed a stunning flight carrying a 15 meter long and 7.5 meter wide UAE flag, which would guarantee him a place in the Guinness World Record through skydiving with the world's largest flag. Al Nayadi is also the first Asian skydiver that flies wearing a 'bird man' costume, which requires a special skill and hard training. The biggest human flag was built a few days ago in the National Stadium of Lisbon (Portugal) by 18,788 women. Rob Molloy officialized the new world record for the Guinness Book. The event was part of the support ceremonies for the football national team leaving to Germany. The now second biggest human flag was built in last February by 13,254 people in Scotland during the rugby Six Nations Tournament. The British Broadcasting Corporation reported on its website on 31 May (2006) that 35,000 England fans (of a 56,233 attendance), prior to their "friendly" match against Hungary at the Manchester United ground, Old Trafford, in Manchester on Tuesday, 30 May 2006, held up 17,500 pieces of plastic to make up a large England flag graphic. The article later states there was a "bit of a hole" in one end of the flags the stand was not full, but if the numbers quoted are correct - and I wonder what the methodology of the Guinness Book of Records is - then this might well have beaten the Portuguese record attempt by some way. The graphic designer behind the project describes it as "public art". On 14 June Sotheby's (New York) sold four battle flags of the American Revolution captured by Col. Tarleton. The first flag (striped, captured in New York in 1779) sold for $12,000,000 (plus a $336,000 buyer's premium), and a set of three Virginia flags captured in South Carolina in 1780 (two regimental, one with stars) sold as a single lot for $5,000,000 (plus $56,000 buyer's premium). Posted 29 April 2006 to Flagwire was an article from The Scotsman about the sale of the Irish tricolour from the Easter Rising. This certainly tops the value of the Shackleton flag which held the record for most expensive. The Irish tricolour used in the 1916 Easter Rising was sold yesterday to an anonymous bidder for �600,000 (�415,000) [that's $758,000 USD or $847,000 CAD]. The linen flag was believed to have flown over the General Post Office in Dublin and was captured by a British Army sergeant after the Rising, before ending up in the hands of a wealthy Catholic family. According to Ivan Sache, one of the oldest references to flags on ships with purpose to identify the nationality is a treaty of 1297 between English king Edward I and Flemish duke Vido (sp?) where it is prescribed that "ship should fly the flag of her souvereign". Also, according to the same source, the flag gained the meaning of the national state identity only in 15th century (in England, many other navies retained practice of putting their identification markings on the sails until much longer). In reference to Adriatic, the Republic of Ragusa (Dubrovnik) had flag prescribed already in the statutes of 1272 (I guess other small states in Adriatic and Tirene seas must have had similar at the same time). E.g. in the statute of the city of Senj from 14th century it was prescribed that a ship that enters the port without a flag shall be financially fined. The 200 inhabitants of Drevvatn north of Mosjoen didn't want to waste money on special transport when they took their 12 metre long flagpole to the town hall. They carried the pole the 35 kilometres from Mosjoen. After three years and 16,000 hours of voluntary work the town hall in Drevvatn is finished at last. On Friday came the icing on the cake: a 12 metre flagpole given to the district as a gift. It came overland, reports NRK, carried by the fit townsfolk who didn't want to waste money on expensive transport. After five hours and 18 exchanges the world's longest relay baton has arrived and the flag is raised for the town hall, its bearers, and Norway's national day, the 17th May. Frisians since 11th in the Gudrun song, describing 9th century. Catalans, image 1035, flag since 13th century? Austria: Seal in 1230; supposed origin in 1191. Denmark: Flag pictured 1340-1370 in the Gelre Armorial; supposed origin 1347. Catalonia, image 1035, flag since 13th century? Scotland, similar flag since 11th century. Denmark, Flag pictured 1340-1370 in the Gelre Armorial; supposed origin 1347. England, flag 1277, shield 1249. Dutch flag since approximately 1600. So: What is the oldest flag? This apparently straightforward question is actually a trap for the unwary, and one into which I have fallen several times. Switzerland and Denmark certainly have a very respectable pedigree, as does the flag of England (even if they were, perhaps, beaten to it by Genoa), whilst the triband of Austria has its adherents etc. I am not a flag historian, none the less (and as an example), according to sources the white cross of Switzerland first made its appearance as a common symbol of the Swiss cantons at the Battle of Laupen in 1339, whilst the Cross of St George made its first appearance in 1277, however, in this latter case (and very possibly in both) it was not a flag but was rather, a distinguishing badge to be worn on the clothing. On the other hand, the Swiss Confederation did not formally adopt the cross until 1814, and as a National Flag until 1889, whilst the Cross of St George has been the de facto flag of England since the end of the 14th Century? Along as we accept that the concept of a 'National Flag' as such is a comparatively recent invention I would say that the Dannebrog is the national flag currently flown which has the longest period of continuous use, however, other flags have valid claims and I don't propose to dig any more of a hole for myself than I have already.